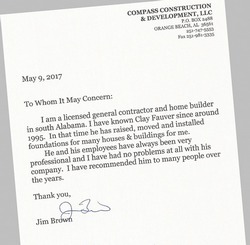 I am a licensed general contractor and home builder in south Alabama. I have known Clay Fauver since around 1995. In that time he has raised, moved and installed foundations for many houses & buildings for me. You didn’t know this, but I have been a fan of your work since you moved a house down on County Road 1 right after Hurricane Ivan. 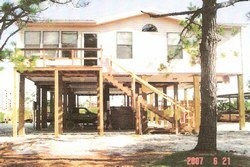 I watched you bring this huge house in from Orange Beach in three sections, put it back together and put it up on pilings. When I had a chance to move my little house, you were the only mover that I called. My moving experience with you and your company could not have been better. 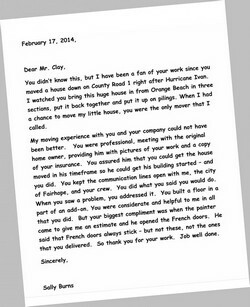 You were professional, meeting with the original home owner, providing him with pictures of your work and a copy of your insurance. 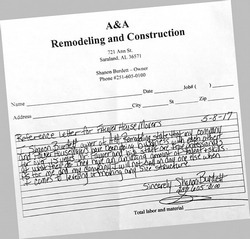 You assured him that you could get the house moved in his timeframe so he could get his building started – and you did. You kept the communication lines open with me, the city of Fairhope, and your crew. You did what you said you would do. When you saw a problem, you addressed it. You built a floor in a part of an add-on. You were considerate and helpful to me in all that you did. But your biggest compliment was when the painter came to give me an estimate and he opened the French doors. He said that French doors always stick – but not these, not the ones that you delivered. So thank you for your work. Job well done. 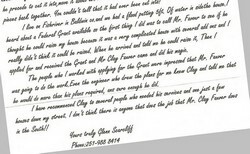 This letter is in reference to the excellent job you and your crew did at our home. I am enclosing photos for you to see the difference. We love the beams you installed in the living room, it really helped with the sway and we feel much safer now. It was just amazing to see your crew install those huge beams in the living room, and with such care. Your company is the most professional and courteous company and we just want to commend you on a job well done and on a terrific crew. We would recommend you to anyone. You have our respect as a business man as well as a person, you went out of your way to help us and we just want to say thank you and stress how much we appreciate your professionalism and your excellent quality of work. 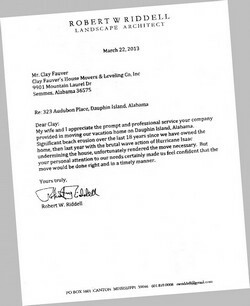 My wife and I appreciate the prompt and professional service your company provided in moving our vacation home on Dauphin Island, Alabama. Significant beach erosion over the last 18 years since we have owned the home, then last year with the brutal wave action of Hurricane Isaac undermining the house, unfortunately rendered the move necessary. But your personal attention to our needs certainly made us feel confident that the move would be done right and in a timely manner. 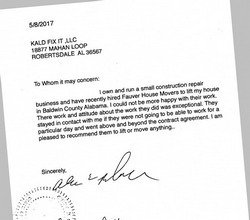 Please accept this letter as a reference to the quality of the work you performed in our home at 227 Octavia St., Dauphin Island, Alabama. We were extremely pleased with the care that you and your workman provided in moving and placing our home and coordination with the city and local utilities. 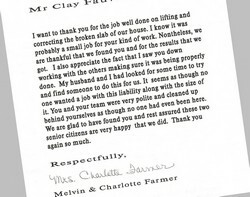 We are especially thankful for the extra assistance you provided which was above and beyond simply moving our home. Feel free to forward my name and phone number (636.667.9317) if any interested party has a specific question. Or they may contact me at [email protected]. 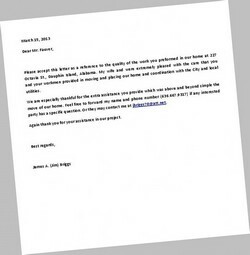 Again thank you for your assistance in our project. Thank you for repairing our house foundation. Your company was a remarkable company to work with. We will recommend you to others. If we need other repairs you will hear from us. Because I am so pleased with the work you did for me last week, I thought you deserved to know. You were able to diagnose the problem and then stabilize the house quickly and efficiently. You and your crew were very professional and eager to please and are to be commended for doing the job so well and leaving the work site in first-class condition. Excerpt: I live on Fish River in Baldwin County and we had a flood putting 5 feet of water inside the house. I heard about a Federal Grant available so the first thing I did was to call Mr. Fauver to see if he thought he could raise my house because it was a very complicated house with several add-ons and I really didn't think it could be done. When he arrived and told me he could raise it, then I applied for and received the Grant and Mr. Clay Fauver came and did his magic. 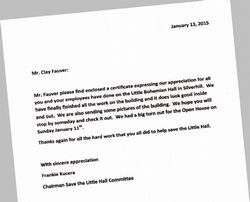 The people who I worked with applying for the Grant were impressed that Mr. Fauver was going to do the work. Even the engineer who drew the plans for me knew Clay and told me that he would do more than his plans required, and sure enough he did. 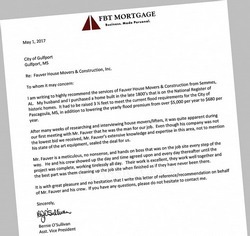 I have had the privilege for at least the last 10 years to have worked with Clay Fauver in dozens of projects in Baldwin and Mobile counties. He has performed his work in the most professional, competent and knowledgeable manner. 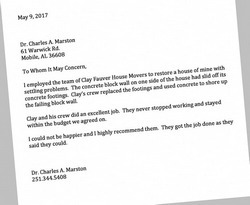 I have worked with Mr. Clay Fauver Construction on several projects over the last 10 Years. 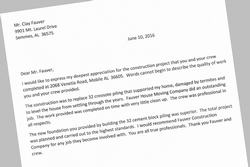 Mr. Fauver has performed many projects with professionalism and expertise often under challenging construction conditions.